Maybe you're planning to leave the virtual confines of your computer to go shopping in the real world on Black Friday...you know, to an actual store that stocks goods you can hold in your hands, not just hover over with a mouse. But you're worried that will mean missing a better price for the same item online. Don't be—if you've got an iPhone or Android smartphone. With a wide range of special Black Friday apps and more general purpose shopping apps now available, you can cast your concern aside and venture forth knowing that a better deal could be just a tap and a swipe away. Many of the apps use the camera built in to the phone for taking a picture of a product's barcode and then use that to find online stores and other nearby retailers selling the same item, along with their prices for it. So you'll know immediately whether to buy it on the spot or to get it elsewhere. Some apps go further and alert you to bargains proactively, enable you to search for retailers' offers by store name or product name or make it easy to share your finds with friends via Facebook, Twitter or a text message. 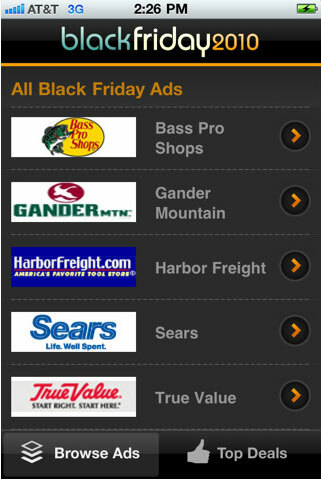 The same BradsDeals team that created BlackFriday2010.com has created an iPhone app, straightforwardly named Black Friday by BradsDeals. In addition to hand-picked Black Friday bargains, the app promises pre-release access to Black Friday ads and links from those to the merchants' websites. FatWallet.com, a deal hunting and sharing website where members can post their finds in online forums, has created Black Friday by FatWallet, an iPhone app that links directly into the site's Black Friday-centric forum. The most recent postings are listed first. Leaked ads, including downloadable PDF copies and alerts received even when the app is closed, are just some of the highlights in TGI Black Friday for the iPhone and Android smartphones. This app also allows you to search for deals across product categories and merchants, and to e-mail deals you've found to yourself or friends. Available in English as well as in Spanish, Black Flyday for Android smartphones adds a gaming dimension to Black Friday shopping. Groups of friends who all use it can form shopping teams and utilize their phones' GPS to share locations of bargains they've discovered with friends and teammates, via either Facebook or a clickable map. The app also saves friends' past posts about deals, and makes those posts searchable for specific items. A deal scroller shows promotions within a desired radius or friends network. Black Flyday can be downloaded for free until Black Friday, when it expires, and after that will cost $9.99 to renew or to buy with "lifetime coverage." One of the leading barcode scanners for iPhone (it was featured in an Apple ad on TV), RedLaser searches for low prices on your chosen item, at hundreds of thousands of online and local merchants––using Google Product Search, eBay, Half.com and TheFind.com––and even finds books in local libraries. It scans a wide variety of barcodes, including UPC and QR codes, and also can be used to send your scanned barcodes to yourself or others as e-mail attachments––to remember your finds for purchasing later. A direct competitor to Red Laser, Scandit for the iPhone also allows you to compare prices at major online and local retailers, including Best Buy and Wal-Mart, as well as get feedback from friends via Facebook, e-mail and Twitter. And Scandit also contains thousands of product ratings and reviews. Another leading barcode scanner app for Android and iPhone, Shop Savvy also lets you search for a product by name or “title,” adding as-you-type suggestions. In addition to online and local merchant prices, a new “Deals” section reveals shipping promotions, coupon codes, rebates, weekend sales and other ways to get a product for less money. A “blue dot” next to a store name or price indicates that the item is in stock at the merchant, and merchants’ return policies are covered, too. Shop Savvy also lets you share deals you’ve found with friends via Facebook or Twitter––and even synchronize lists with others using a Dropbox.com account. 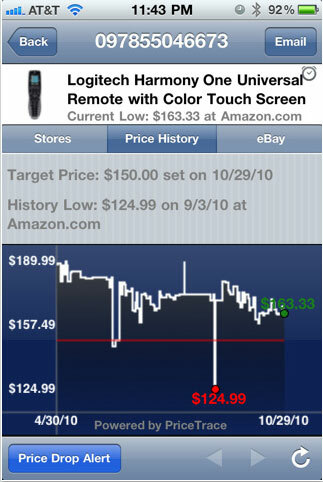 Also giving you the option of barcode scanning or searching for products by keyword, Letshop for iPhone shows you both current prices and a price history chart for your chosen item, across major merchants online including Amazon, eBay, Buy.com, Newegg.com, BestBuy, Wal-Mart, Target, Sears and Kohl’s. Price drop alerts are offered, too, via push notification (not text messages). Yet another barcode scanner app, Barcode Hero for the iPhone allows you to check prices at other stores for a product you’ve just scanned, share a photo of the item and links to information about it with friends to get their feedback on the item, keep track of items to buy later, compose a wish list to share with family and friends, and share your discoveries via Twitter. Product reviews by other Barcode Hero users are available, too. 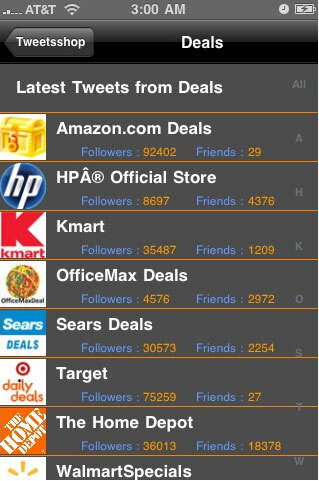 Follow and search for tweets by your favorite online and major retailers’ all in one place: the Tweets-shop iPhone app. In addition to tweets and Twitter photos, this app gives direct access to the merchant’s website, Facebook page and blog. Links in tweets open up in a new screen, and you can reply or retweet, as well. Tied to GottaDeal.com, the GottaDeal Android and iPhone app offers pointers to promotions at online and local merchants discussed by users of its various forums––including a forum dedicated to Black Friday 2010. I love this blog, really very interesting.